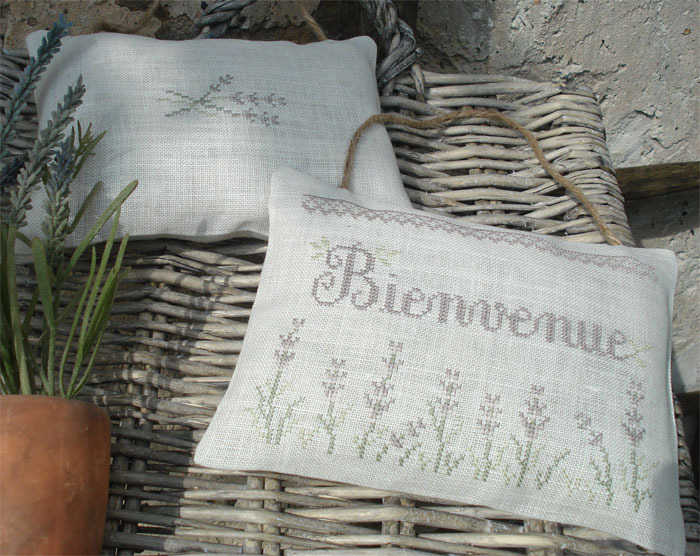 "Lavender Welcome Cushion" is a coloured cross-stitch chart (very easy to follow) with instructions translated in English. The model on the picture has been stitched on a 32 count linen fabric (colour "Ecru") using one strand of cotton over two threads of fabric for a faded effect. But you can stitch it on a lower count fabric using two strands of cotton. Recommended Fabric: of your choice regarding the type (linen / evenweave / Aida) and the stitch count (colour "Ecru" or "off-white"), dimensions 35x30 cm (14x12 in).